John Michael "Mick" Mulvaney (born July 21, 1967) is an American politician. He is the 44th and current Director of the Office of Management and Budget since February 16, 2017. He has been the U.S. Representative for South Carolina's 5th congressional district from 2011 through 2017. He is a member of the Republican Party. Mulvaney served as a member of the South Carolina Senate, representing the 16th district (Lancaster and York Counties), from 2009 to 2011. He is the first Republican to represent South Carolina's 5th district since 1883. On December 16, 2016, it was reported that Presidential-Elect Donald Trump has selected Mulvaney as Director of the Office of Management and Budget. On February 16, 2017, the Senate confirmed him, 51-49. In November 2017, Trump controversially appointed Mulvaney as Acting Consumer Financial Protection Bureau. On December 14, 2018, Trump hired Mulvaney as White House Chief of Staff-designate in an acting capacity. Mulvaney was born in Alexandria, Virginia. He grew up in Charlotte, North Carolina, before moving to Indian Land, South Carolina. He studied at Charlotte Catholic High School and then Georgetown University. Mulvaney ran against Democratic incumbent John Spratt for South Carolina's 5th congressional district. The race was highlighted by Mitt Romney's Free and Strong America PAC's "Take Congress Back: 10 in '10" initiative as one of the top 10 House challenger races. He defeated Spratt, who had held the seat since 1983, with 55% of the vote. Mulvaney won re-election to a second term, by defeating Democrat Joyce Knott 56%–44%. He won re-election to a third term, by defeating Democrat Tom Adams, a Fort Mill Town Council member, 59%–41%. Mulvaney was re-elected to a fourth term, winning over 59% of the vote. Mulvaney aligned himself with the Tea Party movement. On December 10, 2013, Republican Representative Paul Ryan and Democratic Senator Patty Murray announced that they had negotiated the Bipartisan Budget Act of 2013, a proposed two-year budget deal. In 2015, Mulvaney voted against a government-funding resolution, in part because it included funding for Planned Parenthood. Mulvaney opposed gun control initiatives. In September 2015, Mulvaney endorsed Kentucky Senator Rand Paul in the 2016 Republican Party presidential primaries. On December 16, 2016, Mulvaney was announced to have been chosen by President-elect Donald Trump to be the Director of the Office of Management and Budget. Mulvaney's nomination as Director-designate was reviewed in hearings held by the members of the United States Senate Committee on the Budget and the United States Senate Committee on Homeland Security and Governmental Affairs then presented to the full Senate for a vote. On February 16, 2017, the Senate confirmed Mulvaney, 51-49. 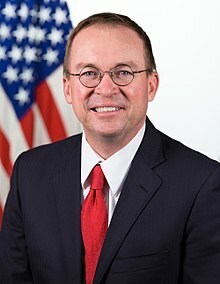 Trump appointed Mulvaney to serve as Acting Director of the Consumer Financial Protection Bureau. Many believe that Trump cannot appoint an Interim director. The dispute has arisen over whether Mulvaney can be so-named under the FVRA or whether a provision of the Dodd-Frank Act controls, which would make the deputy director, currently Leandra English, acting director of the CFPB instead. The Senate may also resolve the dispute by confirming a permanent replacement once nominated by the President. On November 28, 2017, a federal judge ruled in Trump's favor to allow Mulvaney to serve as CFRB Acting Director. On December 14, 2018, Donald Trump named Mulvaney as his acting White House Chief of Staff, replacing John F. Kelly. He was sworn-in on January 2, 2019. Mulvaney has two siblings. He married his wife Pamela West in 1998. They have triplets. He is a Roman Catholic. ↑ Disputed with Leandra English until November 28. ↑ Chris Cillizza (21 July 2010). "Lindsey Graham's vote on Elena Kagan ensures primary challenge". Political news and analysis. The Washington Post Company. Retrieved 10 August 2010. ↑ "Rep. Mick Mulvaney: A freshman's view of Washington". ↑ "Trump picks US Rep. Mulvaney to head White House budget office", Reuters via CNBC, December 16, 2016. ↑ 4.0 4.1 "U.S. Senate: Roll Call Vote". www.senate.gov. Retrieved 2017-02-16. ↑ 5.0 5.1 Dayen, David (2017-11-24). "Richard Cordray Sets Up Titanic Struggle For Control of the Consumer Protection Bureau with Last-Minute Move". The Intercept. Retrieved 2017-11-25. ↑ "Mick Mulvaney named as acting White House chief of staff". ↑ "MULVANEY, Mick". United States Congress. ↑ "Arena Profile: Rep. Mick Mulvaney". Politico. ↑ Paul Conner (October 28, 2010). "Romney stumps in South Carolina as Mulvaney opens lead on Spratt". The Daily Caller. ↑ "2010 General Election". South Carolina State Election Commission. November 18, 2010. Retrieved 2012-05-28. ↑ POLITICO. "2012 Election Results Map by State". POLITICO. ↑ "Mulvaney easily defeats challenger to represent 5th Congressional District". GoUpstate.com. ↑ "South Carolina: Haley, Graham re-elected; Scott to finish term". charlotteobserver. ↑ "South Carolina Election Results 2014: House Map by District, Live Midterm Voting Updates". POLITICO. ↑ "2016 Statewide General Election official results". South Carolina State Election Commission. Retrieved December 5, 2016. ↑ Jeremy Herb (January 23, 2017). "Trump's tea party budget chief on collision course with GOP hawks". Politico. ↑ Erik Wasson; Russell Berman (December 11, 2013). "Ryan budget deal gets positive review at closed-door Republican conference". The Hill. Retrieved December 12, 2013. ↑ "The madness resumes". The Economist. September 26, 2015. ↑ Jake Sherman (December 3, 2015). "GOP unmoved on gun control as massacres pile up". Politico. ↑ "Rep. Mick Mulvaney endorses Rand Paul for president". Washington Post. September 21, 2015. ↑ Shear, Michael (December 16, 2016). "Trump Picks Mick Mulvaney, South Carolina Congressman, as Budget Director". The New York Times. Retrieved December 17, 2016. Wikimedia Commons has media related to Mick Mulvaney. This page was last changed on 3 January 2019, at 16:33.